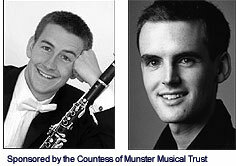 The 53rd season opens with the 2005 overall winner of the Royal Over-Seas League music competition – Timothy Orpen on the clarinet. Born in Australia in 1983, he began his musical studies shortly after moving to England at the age of 8. He won a scholarship to study at the Royal Academy of Music where he won a number of prizes, including the Geoffrey Hawkes Clarinet Prize. He was a woodwind finalist in the BBC Young Musician of the Year 2002. Timothy has performed with a number of orchestras including the Philharmonia, London Chamber, Northern Sinfonia and Royal Philharmonic. He has taken courses and masterclasses with artists such as Sabine Meyer and Michael Collins. Timothy has recently performed at the Wigmore Hall and gratefully receives the support of the Countess of Munster Musical Trust. His accompanist, John Reid, read music at Clare College, Cambridge where he gained an M.Phil. in musicology before taking up a scholarship at the Royal Academy. 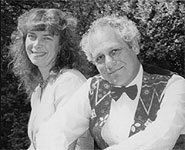 He has taken lessons with Malcolm Martineau and his many awards include the 2003 Kathleen Ferrier, Maggie Teyte and English Song accompaniment prizes and the 2004 Gerald Moore Award. He made his Wigmore Hall debut in May 2004 with Lucy Crowe and has given concerts at the Purcell Room, St John’s Smith Square and the Linbury Studio. Our second concert features the internationally renowned pianist Kathryn Stott, already familiar to BMS members, in a splendid recital including two beautiful Fauré Nocturnes, Ravel's Jeux d'eau and Sonatine, and Schubert's much loved Impromptus in G flat and B flat. The programme also presents Rachmaninov's Sonata No. 2 in its revised version. Born in Lancashire, she studied at the Yehudi Menuhin School with Vlado Perlemuter and Nadia Boulanger, and was a prize-winner at the 1978 Leeds International Piano Competition. She has collaborated with many leading string quartet groups, including the Belcea and Skampa, as well as the Lindsays, in whose farewell concert series she was invited to appear. Many members will be familiar with her complete solo piano music of Fauré on the Hyperion label. She is a frequent recitalist in leading venues throughout the world and will be a highlight of our current season. Our Christmas concert, this year in St Peter’s Church, Berkhamsted, will be given by the young ensemble group EXAUDI. Formed as recently as 2002 by James Weeks (director) and Juliet Fraser (soprano), but already winning friends across the UK their wide-ranging repertoire spans the Early and High Renaissance to the contemporary music scene. EXAUDI are strongly committed to educational initiatives in both composing and singing and have given numerous workshops and seminars for organisations such as the Purcell School and Endymion at the South Bank. Their programme will feature medieval songs, English Renaissance music German settings and great Christmas hymns from such composers as Praetorius and other settings appropriate to the Advent season. The February concert features the Quince Quartet, comprising Chris George and Matthew Truscott (violins), Juliet Jopling (viola) and Amy Norrington (cello). Founded in 2003 and coached by distinguished members of the Alban Berg Quartet, the Takacs Quartet and the Endellion Quartet, they have recently established their reputation in the string quartet field. 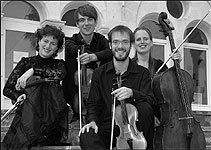 They performed in 2005 in Sheffield’s Music in the Round series as finalists for the residency left open by the Lindsay Quartet’s retirement. Their performance of the Beethoven Quartets series at the Wigmore Hall is a highlight of the 2006/7 season. With reviews including comments like “... the musicians ... produced an exquisite sweetness of tone ...” and “... their abundant energy and pure enjoyment were delightful to witness ...” we are anticipating a memorable string quartet evening. The season concludes with the well-known, much loved and formidable piano duo artists "the dazzling husband and wife team" (Gramophone) of Goldstone and Clemmow. They formed their duo in 1984 and have gained a special reputation for their refreshing, enthusiastic approach to concert-giving. Just some of the reviews whet the appetite: "...dream team ... stunning performance" (The Herald, Glasgow); "an enthralling experience ... incredible" (Yorkshire Post); "we must be enormously grateful to them" (Daily Telegraph). 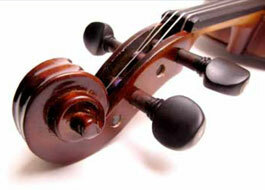 They have played in six continents and with many leading orchestras and conductors. The programme includes such beloved items as the late Schubert Fantasie in F minor D.940 and less well-known items like the Yiddish Dances by Adam Gorb, described as a "riot", and the "Romeo and Juliet" music of Tchaikovsky, arranged by Madame Rimsky-Korsakov is a tremendous blockbuster. "... tonal allure and stylish panache ..." says the BBC Music magazine, and brings a memorable end to the 53rd season.